Ich habe mir endlich mal etwas von Fenty Beauty gekauft! :) Ich war so extrem auf den flüssigen Lippenstift gespannt und konnte es kaum abwarten den auf den Lippen zu tragen! Die Verpackung ist so schön und ich liebe roten Lippenstift. Ich dachte ich zeige euch einfach mal die zwei Produkte die ich gekauft habe in seperaten Posts, da es sonst wegen den Bildern zu lang werden würde. I finally bought something from Fenty Beauty! :) I was so extremely curious about the liquid lipstick and could not wait to wear it on my lips! The packaging is so beautiful and I love red lipstick. I thought I just show you the two products that I bought in separate posts, otherwise it would be too long because of the pictures. Fenty Beauty ist die Marke von Rihanna, die zur Zeit total gehyped wird. Viele sind mit der Foundation und den Highlightern zufrieden. Mich hat ehrlich gesagt sofort der Highlighter "Trophy Wife" angesprochen aber es ist ein gelber Highlighter und dann habe ich mir überlegt den doch nicht zu kaufen, da ich den bestimmt eh nicht so oft benutzen würde und er auch als Lidschatten zu gelb ist. Aber als ich gesehen habe, dass ein flüssiger roter Lippenstift raus kommen wird habe ich ihn sofort am Erscheinungsdatum bei dem Sephora Frankreich Online Shop bestellt! :) Der Lippenstift kostet 22,95€ und man muss dann 10€ Versandkosten bezahlen aber es fallen keine Zollkosten an. Es soll das perfekte rot sein, dass jedem steht und der Lippenstift soll 12 Stunden lang halten. Ich finde die Verpackung sieht so richtig edel aus und das kühle rot ist wirklich perfekt! Dieser Rotton kommt wirklich sofort auf meine Top 2 Liste der schönsten Rottöne. Es ist nicht zu hell und sieht aufgetragen perfekt aus und ist extrem gut pigmentiert! Ich habe noch nie so einen Applikator gesehen, ich finde es gut, dass der kurz ist. Man kann den Lippenstift damit richtig leicht auftragen. Der Lippenstift wird dann fast matt und die Lippen fühlen sich samtig an und man merkt gar nicht, dass man etwas auf den Lippen hat weil es sich so leicht anfühlt. Wenn man etwas vorsichtig isst und trinkt geht der Lippenstift nicht ab aber ansonsten schon. Es ist leider so ein Lippenstift der leicht übers ganze Gesicht verschmieren kann, was mich bei der schönen Rotfarbe total traurig gemacht hat, ich konnte es ehrlich gesagt nicht glauben! Vor allem ist es kein Lippenstift den man zur Arbeit tragen kann weil man andauernd checken muss ob der nicht schon verschmiert ist und im Sommer würde der bestimmt dahin schmelzen. Es ist einfach ein Lippenstift in flüssiger Form, nicht so einer der ganz matt wird und wie ein Tattoo den ganzen Tag hält. Irgendwie ist es total enttäuschend das versprochen wird, dass der so gut ist und lange hält aber so heftig verschmiert und wenn er verschmiert kriegt man ihn nicht einfach so leicht ab, man muss sein komplettes Make-up von vorne dran machen! Wenn man sich die vielen positiven Review's anguckt und man ihn jetzt selber getestet hat ist es einfach lächerlich. Ich finde den Lippenstift trotzdem wunderschön und ich werde ihn so oft wie es nur geht tragen aber für den Preis erwartet man doch ein bisschen mehr. Fenty Beauty is the brand of Rihanna, which is currently totally hyped. Many are satisfied with the foundation and the highlighters. To be honest, I immediately fell in love with the highlighter "trophy wife" but it is a yellow highlighter and then I thought about it again and did not buy it because I would not use it so often anyways and it would be too yellow as an eyeshadow. But when I saw that a liquid red lipstick was coming out, I immediately ordered it on the release date at the Sephora France online shop! :) The lipstick costs € 22.95 and you have to pay € 10 shipping costs but there are no customs fees. It's supposed to be the perfect red that everyone suits and the lipstick should last for 12 hours. I think the packaging looks really classy and the cool red is really perfect! This shade comes immediately on my top 2 list of the most beautiful reds shades. It is not too bright and looks applied so perfect and it is extremely good pigmented! I have never seen such an applicator, I think it's good that it's short. You can apply the lipstick so easily. The lipstick gets then almost matte and the lips feel velvety and you do not feel that you have something on your lips because it feels so lightweight. If you eat and drink something carefully the lipstick does not come off but otherwise it will. 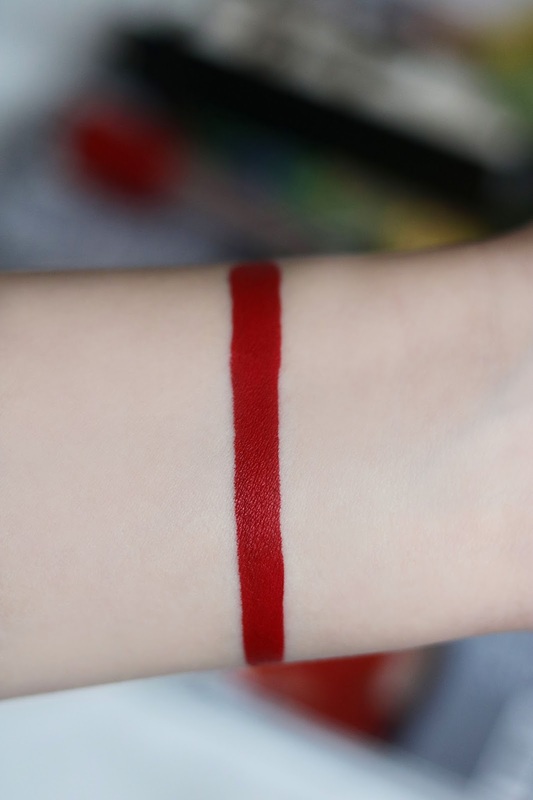 It is unfortunately such a lipstick that can easily smear over the whole face, which has made me totally sad because the red is so pretty, I honestly could not believe it! Above all, it is not a lipstick that you can wear to work because you constantly have to check if it is not already smeared and in the summer it would certainly melt. It's just a lipstick in liquid form, not one that gets completely matte and lasts like a tattoo all day long. Somehow it's totally disappointing that it is promised that it's so good and lasts so long but smears so badly and if it gets smudgy you just can not get it off so easily, you have to do your complete make-up from scratch! If you look at the many positive reviews and you've tested it yourself, it's just ridiculous. I think the lipstick is still beautiful and I'll wear it as often as I can but for that price you expect a little bit more. Ah that lip colour just makes me so happy! 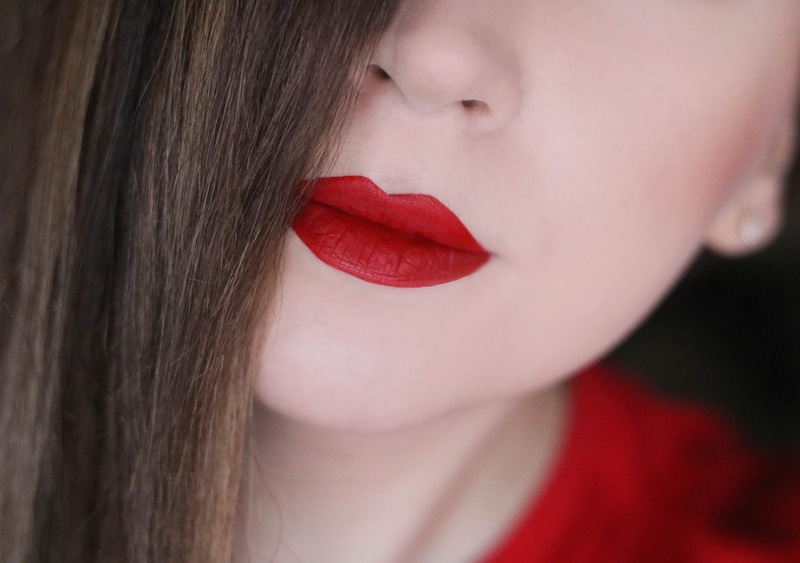 The perfect red holiday lipstick. Wow, der Lippenstift machen einen klasse Eindruck! Den gelben Highlighter fand ich auch am besten, allerdings bin ich nicht dazu gekommen dort zu bestellen. Auch die Foundation soll klasse sein.